Nowadays people are giving much importance to fitness. Swipe has announced its first fitness tracker named ‘FBand’. 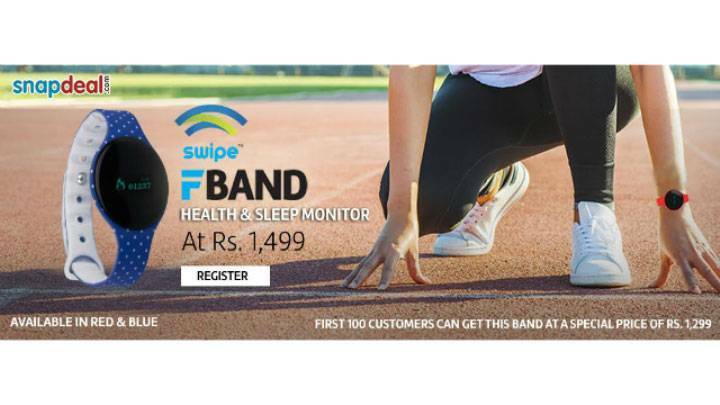 FBand is only available on Snapdeal. This fitness tracker is priced at Rs 1499. Also, first 100 customers will enjoy aspecial offer and will get the tracker at an offer price of Rs 1299. Swipe FBand is available in two colour options ie. Blue and Red. FBand has 55 mAh battery and a single charge can last upto 7 days. The FBand helps in tracking your health, sleep and also tracks calories burned, etc. Also, with the help of the band, one can receive the incoming calls which a good feature at this price point and it looks like smartwatch rather than Fitness Band.